In case you forgot to celebrate Ravioli Day on March 21…I would like to share a recipe I like to call Take Some and Leave Some Ravioli. When I worked evenings (last night was my last one since I am changing jobs) I liked to find recipes that I could take some with me and leave the rest for my husband and babe to eat. 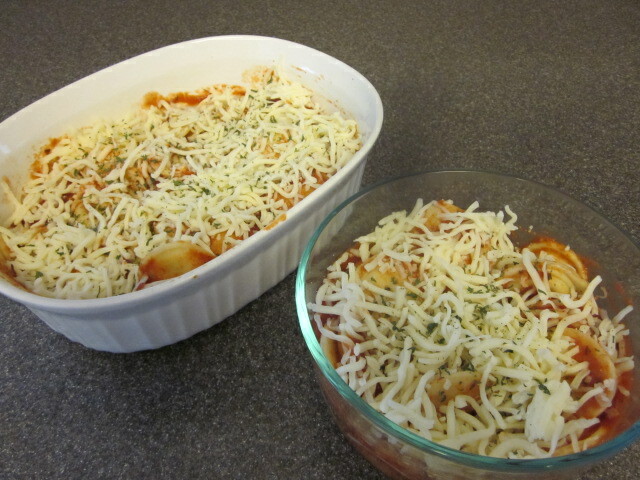 This recipe, as the name implies, is great for packing a portion and leaving the rest. I cooked the ravioli and added some of our homemade pizza sauce, but you could also use spagetti sauce. Then top it with mozzarella cheese and a little parsley for color. I heated up my portion in the microwave at work and my husband cooked his in the oven until it was heated and the cheese melted. Mall food trays dirty as toilets? I bought this ravioli…it is from the freezer section. I’m not sure what brand I bought. I have tried several different kinds and they have all been good. I would love to try to make some homemade sometime! I just need to find the time! I buy Buitoni ravioli. It’s really good. You can find it in the cooler section of ethic aisle at Kroger. Last week I had coupons so I stocked up and i have 4 cheese ravioli and tortellini in the freezer.